The Price: 89 cents. (Prices may vary at participating locations.) The Verdict: C-. At a glance, this "new" Cheesy Double Decker Taco seems like a déjà vu; didn't they already offer a taco within a taco before? Saturday Night Live has already done a parody commercial about tacos wrapped around other tacos, and then some. Looking at Taco Bell's menu, there is in fact already a "Double Decker Taco," which is "a warm, soft flour tortilla spread with hearty beans and wrapped around a crunchy, corn taco shell filled with seasoned ground beef, crisp shredded lettuce, and real cheddar cheese." When I asked the manager at my local Taco Bell what the difference between the two is, he simply said, "the Cheesy Double Decker Taco has nacho cheese." If you do a little reading and a little math, you'll come up with the same conclusion: the Cheesy Double Decker Taco is merely the regular Double Decker Taco with an added 30-calorie smear of melted cheese spread in between the corn shell and the flour tortilla. With that said, there's not much to say in terms reviewing a new menu item; it's the same old Taco Bell ingredients, and you'll either love it or hate it, or have some sort of opinion in between depending on your budget, position in food politics, and/or state of inebriation. Personally I find the food at Taco Bell really bland, which is probably intentional since they have a mainstream customer base with a generally milder palate -- but at least they offer hot sauces in varied degrees of heat. (However, Fire sauce, the hottest of their offerings is still tame for my tastes.) This taco-within-a-taco concept is no exception to this blandness, but it is a mouthful, with all those ingredients packed in each bite. 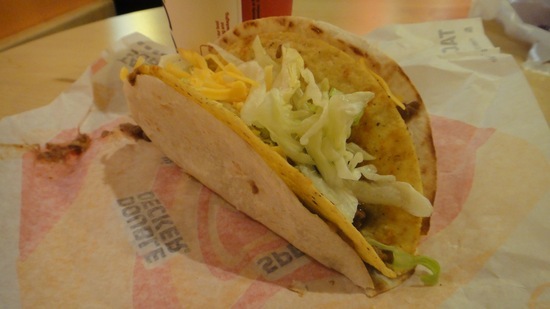 It is quite filling for a taco, however, the extra smear of nacho cheese in this new incarnation of the Double Decker really adds nothing to the Taco Bell eating experience; the refried beans overpowers its taste and texture anyway. Plus there's already shredded cheese on both Double Decker Taco offerings, so it's not like there wasn't cheese to begin with. There's no point arguing this fact though, especially in a lawsuit, since it will probably be withdrawn or counter-sued anyway; the folks at Taco Bell know their customers will go for the novelty of something "new," even if it's really just the same old thing.